Welcome to the website of Out West Stallion Station and Performance Horses, where western heritage has merged with state-of-the-art breeding and training facilities. Owned by Bobbie Cook, Out West Stallion Station is where you will find world class performance horses bred, raised and trained for Reining and Working Cowhorse events. 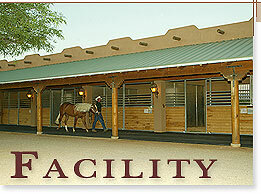 Nestled in the beauty of the Scottsdale, Arizona’s Rio Verde landscape, we have carefully designed and built a World Class, full service breeding and foaling station, equipped with the latest technology to assist us in providing the very safest, accurate and efficient AI and foaling services anywhere. In addition, we have three beautiful, Santa Fe style barns that house the stallions, foaling mares and performance horses. Please visit the Gallery page to view more images of Out West Stallion Station.